Illinois Negligent Security Statute of Limitations | Hupy and Abraham, S.C.
How long do I have to file a civil case for negligent security if I’ve been attacked in Illinois? 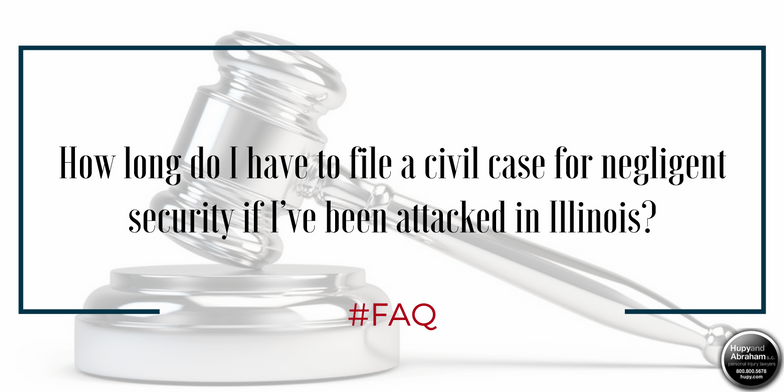 If you were injured in an attack on someone else’s Illinois property and the attack could have been prevented had the property owner provided reasonable security, then you may have the right to file a civil negligent security claim. However, Illinois, like other states, limits the amount of time that you have to file a case. If you fail to file a case before the statute of limitations expires then you may be unable to make a legal recovery. Generally, the Illinois statute of limitations for a personal injury claim is two years. You were under the age of 18 when you were hurt and your parent or guardian failed to take action on your behalf. You were mentally incompetent at the time that you were hurt and were unable to make decisions. In either of these cases, you should speak to an experienced attorney as soon as possible because your time to file a claim is still limited. While Illinois law allows you to wait two years to file a case, it does not require you to wait two years. Instead, it is important to take action as soon as possible so that the evidence in your case is more readily available and so that you can recover damages sooner. Please download a copy of our free book, Negligent Security: What You Need to Know About It, to learn more about how a negligent security case works, and please call us directly at 1-800-800-5678 at any time to get your questions answered or to schedule a free, no-obligation consultation. Posted on 09/09/2016 What Injuries Could You Suffer If a Property Owner Provides Negligent Security?